At Sonic-Shield, we use both sound barrier and/or sound absorption materials to dampen or completely deaden noise from a variety of sources. Soundproofing for commercial buildings requires understanding the types of indoor noise, such as interior sound transmission, sound reflection, and reverberation that occur in these settings. Below, you’ll find examples of some common commercial noise issues, and how we generally address the problem. We use combinations of sound barrier and sound absorption materials, combined with customized construction techniques, specific to your noise problems to reduce the sound transmission through exterior or interior walls. 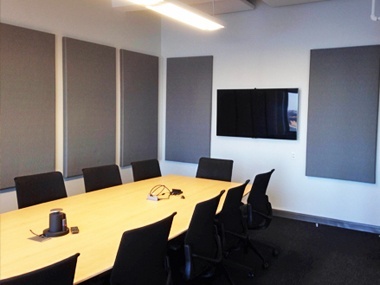 When added to a typical wall, our Sonic-Shield acoustic barrier materials can increase the STC – sound transmission class – of the wall from 33 to over 53, reducing the perceived loudness of the transmitted noise by 75 percent. While many common sound transmission issues come from individuals occupying hotels and multi-room facilities, a multi-level commercial building, especially with manufacturing machinery, creates impact noise that can easily pass through floors and disturb occupants below. To solve for an extreme case like this, we use combinations of sound absorbing underlayment on floors and sound barrier and sound deadening materials on ceilings to reduce the transmission of sound through floors. Windows can transmit the largest amount of noise into offices - especially when they aren’t built and installed properly. Various solutions can be employed to reduce this noise, including the use of acoustic windows, sound dampening treatments in the window mullions, and acoustic caulking or acoustic films applied directly on the window, which dampens airborne noise without having to replace the windows. After the windows are upgraded, many customers are happy with the reduction in noise. Machine generated noise from fans in HVAC systems travels through the ducts and return vents, and may affect every room in the house or office. We have developed effective duct and fan silencers that are capable of reducing noise by 15-20 dB, a reduction of perceived loudness by 67-75 percent. In some cases, we will prescribe the use of acoustical plenums or acoustical wraps on the ducts to eliminate resonance or noise from duct panel vibration, as vibrations generally mean more noise. For outdoor noise from HVAC units or evaporators, we have developed a modular sound deadening solution, containing both sound barrier and sound absorption materials, which are capable of reducing the direct transmission of noise to the environment and minimize acoustical reflections off of nearby walls and structures. Typically, we suggest constructing an enclosure to go around the AC unit and apply the barrier and absorption materials inside the enclosure. We offer a full range of soundproofing products and customized soundproofing solutions to solve even the most demanding noise problems. Our team of acoustic experts can help you identify sources of commercial noise and rapidly develop cost-effective solutions to eliminate, block or absorb the noise. At Sonic-Shield, we believe that while there may be similarities, no two commercial noise pollution problems are exactly alike. Accordingly, our soundproofing solutions reflect our ability to identify, and when necessary, develop and fabricate the appropriate soundproofing materials for your particular needs. So whether you have a problem requiring an immediate solution or have the luxury of planning for a problem that will exist in the future – inside or out – we would love the opportunity to discuss your noise or vibration problem with you.